I believe that's a D35 pickguard. Don't think so, dreadnought guards had different contours than F-body 'guards so countours wouldn't have matched as in Bonneville's photos. Dreadnought 'guards just don't look right on F-bodies. Also in general for a given period it would have been the same guard on all the dreadnoughts unless there was a special color reserved for a model, like black on D55's. Can't recall ever seeing anything like that on any other dread models. Last edited by adorshki; 03-19-2019 at 07:56 PM. I happen to like black pick guards with ebony fret boards, tortoise with rosewood. I'd say the guard is dead nuts the same as the one I made for the D4-12, which someone had scraped the original giant guard off off (can't blame them, it's too big, goes all the way to the bridge, it's a turn off for me too), and the guard someone had replaced the oversized original with was this small dread pickguard shape. I have a good mind for figures, and there's no that many pickguard shapes for these old guitars. I spent about three months studying this back in 2016 I think it was. I've got a pretty good eye too, but much better in real life than from pics. To be fair though you could be ight, and I can see it's possible Guild may have even used a kind of "universal 'guard" which fit both shapes closely enough for a time, but my comment was based on how different the early F50 is from the '78 Bonneville posted. That might well be a kind of "universal" guard on '80's-'90's era guitars. Anyway, I think of the "F body" guards as traditionally a little skinnier in the waste and a little wider by the bridge to better complement the F-body shape. Note the 'guard on your D4-12 is pretty equal depth at its widest, on both ends. If it had been properly matched to the fretboard it would have required extensive radiusing to match the rosette correctly, and wouldn't have covered the outline of the original. Wow! Thanks for all the feedback from the Guild community. Best news to hear is that most agree that what is on my guitar won't cause any further damage. I really do appreciate the advice and offer for "Guildedagain" on sending a piece to fill the gap but I think I am going to pass. Thank you though. I am going to leave her as is for now until I find the right person to help me replace it with a black pickguard to match the ebony fretboard. I'm in no rush and I am just so glad I found this guitar. Also, today I got a personal email from Hans Moust about answering questions about my guitar. I usually do not respond to random emails but he looks pretty legit and nice to see others on this site referring to him. In an effort to support and give back to his community, I will get back to him. Last edited by Bonneville88; 03-20-2019 at 12:56 AM. A black guard is the best bet for that guitar, try to save the one that's on it. Any old Guild guards are hard to find. Steve, good luck with whatever path you take. Just go slow. 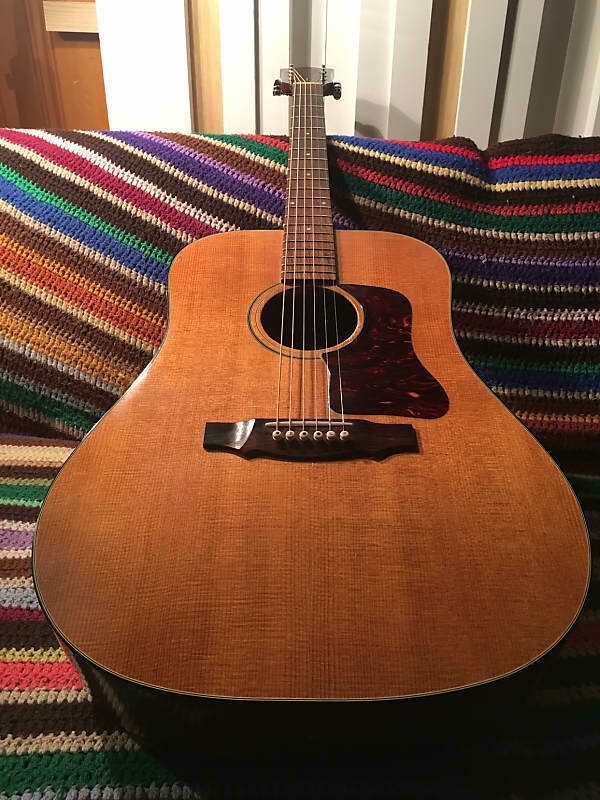 1967 MK-VI Artist Special (Hoboken - Jacobs restoration 2018) - "The Mark"
2010 F-212XL STD (New Hartford) - "Connie"
I just sent Hans an email answering his questions about my guitar. I hope to someday read his book and it sounds like he is working on new one. Also, if I ever take the old pickguard off my guitar I will be sure to save it and pass it on to someone on this forum who may find it useful. Early '60s, mid-60s, late 70's, and an '11. Last edited by Bonneville88; 03-21-2019 at 02:05 AM.